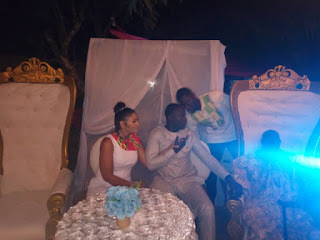 Ghanaian actor and broadcaster, Chris Attoh, yesterday September 6, 2018, tied the knot the second time after his first marriage with Nigerian actress Damilola fell on the rocks in 2017. 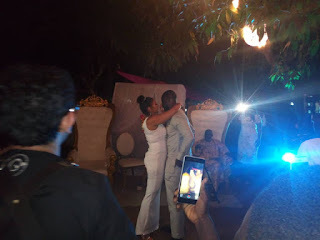 The private ceremony took place at North Kaneshie in Accra. Online reports indicate that Chris’ new wife called Betty is a Caribbean who is based in the United States of America. 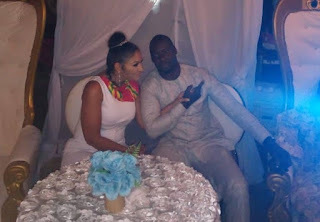 Chris Attoh’s marriage to new wife Betty will definitely come as a shocker to his ex, Damilola, who recently posted the message: “This time, I will be looking out for a man; he has to be a man (in the real sense of the word). I don’t try to foresee things as I prefer to live in the moment. I learnt a lot from my past experience (in marriage) and I may have to write a book about it. There are quite a lot of things and I wouldn’t want to single out one. If I single it out, it may seem like the most important one when it’s not so; they are all very important.” This message was viewed by many as a shade to Chris Attoh for not being a real man. Chris Attoh is very popular for the roles he played in movies Single and Married, Tinsel, Sinking Sands, Journey to Self, his latest Bad Luck Joe, and many others.